Justin Bieber is the No. 1 pop star in the teen market right now, but other young singers are trying to follow in his footsteps. (CNN) -- Who wouldn't want to be Justin Bieber? With millions of albums sold, a cadre of rabid fans known as "Beliebers," texting privileges with Kim Kardashian, a planned film role and buckets of money pouring in, life is pretty sweet for the 16-year-old. So it's no surprise that a new crop of young, male singers are hoping to blaze the same trail. Enter the "wanna-Biebs." Artists such as 13-year-old Australian Cody Simpson, 12-year-old Chicago, Illinois, native Jawan Harris, 12-year-old Shun Hendrix -- aka Lil Shun -- and 13-year-old YouTube phenom Greyson Chance are just a few who are being viewed as heirs to the Bieber dynasty. But Monica Herrera, news editor for Billboard.com, says it's not that easy to follow in the large footsteps of the Bieb. "There have been a few attempts to replicate the type of success Bieber has had, but it's not like when Backstreet Boys spawned 98 Degrees and their whole ilk," Herrera said. "I think that's because Bieber does have such a hold on the industry right now, and he's so huge. With an older audience, you can capture different segments of the audience and spread the wealth a bit, but that's not the case with the younger crowd." The newbie singers appear to be following the WWBD career path. Bieber is well-known for attracting collaborations with hip-hop artists, including rapper Ludacris, and new singer Simpson has rapper Flo Rida as a guest on his first single, "iYiYi," which already has topped the charts in his native Australia. 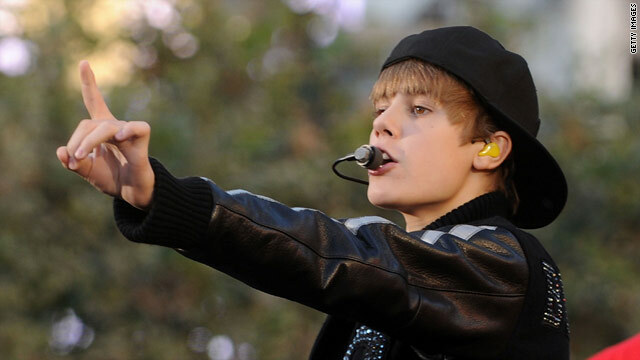 Bieber was discovered and is mentored by R&B star Usher, while Lil Shun is on rapper-actor T.I. 's Grand Hustle label, and Harris can be seen in the music video for his debut song, "Nobody," receiving dance instruction from singer Chris Brown. Bieber uses Twitter pretty prodigiously to keep in contact with his fans, and Chance, whose rendition of Lady Gaga's "Paparazzi" quickly went viral on YouTube, is also well-known for reaching his peeps via tweets. Dean Cramer, editor of the music site Kings of A&R, said young females are major consumers of music so it makes sense that record labels would want to tap in to that audience. But there are also pitfalls to marketing to that segment of the population, he said. "The teen market is very fickle, and their tastes change so quickly," Cramer said. "I don't think Bieber is going to throw open the doors to a slew of successful teen artists. There will always be a few who pop up every now and again as has happened since the 1970s, but that happens sporadically." Bieber's gargantuan success (the Canada native has sold 4 million-plus albums and almost 8 million downloads so far this year, according to Nielsen SoundScan) is widely attributed as one of the factors that led "American Idol" producers to lower their age limit requirement from 16 to 15 to attract younger, potential contestants. But Bieber's vocal coach, Jan Smith, said the hit Fox show also has fueled the dreams of plenty of aspiring teen singers -- and their parents -- that they can be the next Bieber. "Because of 'American Idol' there's a sense that everybody can be a star now and that's not really true," said Smith, who has been flying in to work with Bieber while he's on tour. "There's a difference between a star and a kid that has a really good voice. Justin writes his own songs; he works on beats; he plays piano, guitar and drums; he arranges his own vocals. He's an artist." Her studio in Atlanta sees about 200 potential clients a week, and business has absolutely picked up thanks to "Bieber Fever," she said. Smith also works with both Harris and Lil Shun and said both singers are trying to carve their own niche, and not necessarily be known as "the next Justin Bieber." Harris, whose style have drawn comparisons to a young Michael Jackson, and Lil Shun, who mixes R&B with hip-hop, are talented enough to stand out from the pack, she said. "I think people are tired of facsimiles, and they are looking for authenticity," Smith said. "[Harris and Lil Shun] are not copying Bieber. They have their own sound, have something different going on and are signed to labels that have a vision for the integrity of their artists." At least one of the singers recognizes that reaching for the Biebersphere is a pretty big stretch. Chance told CNN at the MTV Video Music Awards that he viewed Bieber as an inspiration but doubted he would ever surpass the singer's talent level. Plus their styles are different, Chance said, and he could never be able to pull off the slick dance moves Bieber displayed at the awards show. "I'm more of a sit-down, piano, rock-out guy," Chance said.